Have you ever had a glass of champagne on an empty stomach at 10.15 in the morning? The world is at once full of golden excitement, but it's all faintly unreal. As I left St John's Wood Tube station it was obvious that everybody else on the road to Lord's was feeling the same way. The fizzing of infinite possibility filled the golden air. 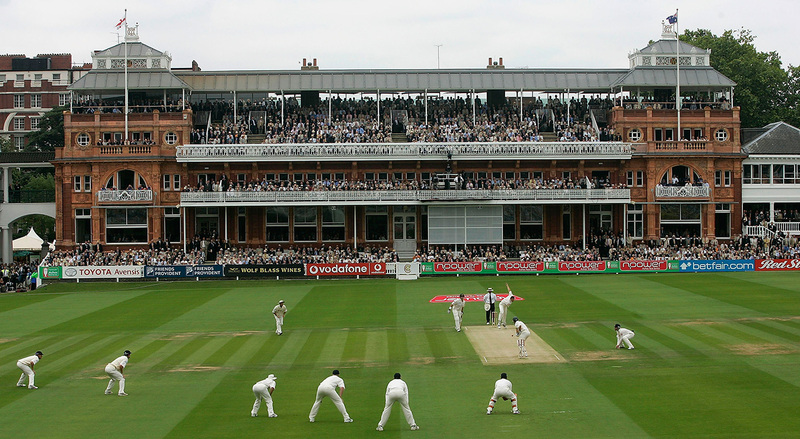 The year was 2005, England were about to play Australia in the first Test of the Ashes series, and for the first time in damn near two decades - two decades of continuing, protracted and gloating humiliation - it seemed that England had a chance. Even the touts were excited. Everyone was walking with a strange bounce in the step. Something special was on hand and lucky old us were going to see it all unfold. I don't care about the result, people were saying all over the country. Just so long as we are competitive. Just so long as we give an account of ourselves. Just so long as the Australians know they have been in a game. It seems a modest hope, written down like that. But you have to set it in context: all those years in which England became officially the world's worst Test nation and the futility of every tentative recovery was mercilessly revealed by Australia. Now England were once again recovering. They had won five series in a row. They looked a half-decent side. But it was Australia, it was the Ashes, and it was this heady mixture of hope and fear that made the blood sing in this unwonted way along Wellington Road. The players felt it too. Steve Harmison, England's strike bowler, said afterwards: "It was the one and only time that I enjoyed walking through the Long Room. You knew that this was going to be a special series." The players clattered through the Long Room on their way to the pitch to bowl against the highly accomplished bullies who had caused them so much pain across the years. 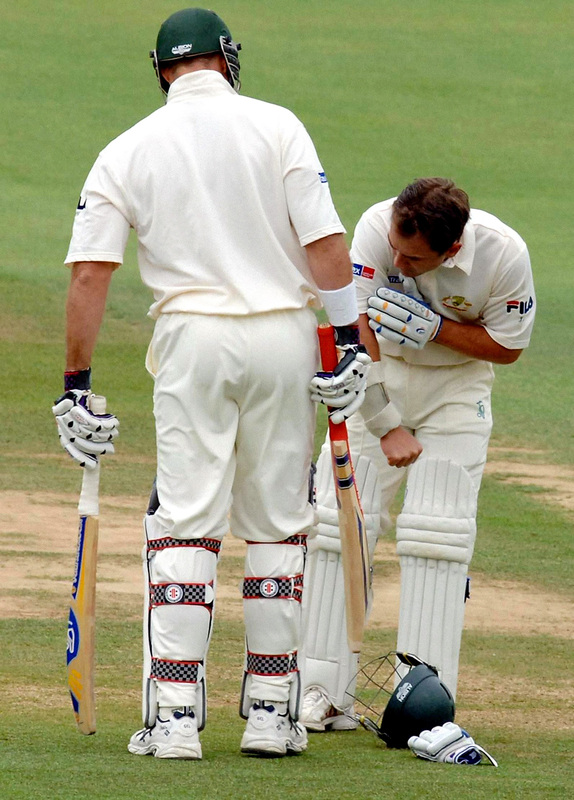 Justin Langer prepared to take the first ball. There was a moment in which it seemed the entire world caught its breath, and then there was an explosion of action. But it was the second ball that had something of magic about it. And it's the second ball that qualifies as one of my top ten moments in cricket. The pitch was that rare thing in modern cricket, a sporting wicket, and Harmison got it to jump. It cracked Langer on the elbow in mid-leap. The world caught its breath again, but this time it was different. It was the moment when wild hope turned into awed belief. We could do this, you know. We really could bloody well do this. All around the old ground eyes were slightly glazed, mouths were slightly open and powerful obscenities and blasphemies were expressed in 20,000 whispers. Here was a bully being bullied. Here was a bully all in a heap and waiting for the trainer to make him better. This was to be a series full of magic moments. I could choose a dozen more, from this series alone. But this is the moment that stands out. It was the moment when hope became a matter of real and pressing urgency. A graph of the emotions of that series would look like a set of crocodile teeth. That match and even that day was to hit sky-reaching peaks before plunging into abyssal depths. England bowled Australia out for 190 but plunged to 21 for 5 in reply, 92 for 7 at close of play, 155 all out. They eventually lost the match in traditionally supine fashion. It looked as if normal service had been resumed, and I didn't even bother to attend the next Test, which is said by some to be the most dramatic of all time, with England winning by two runs. England went on to take the series. After the last and extraordinary day - I could give you at least three magic moments from that day alone - I was sent a T-shirt that bore the legend: "Now I can die happy." Seems a little over the top now, I know, but you had to have lived through the bad years to understand the meaning of that mad and glorious summer. The Harmison moment wasn't the turning point of the series. It didn't decide the match, or even the balance of power on the day. But I shan't forget the extraordinary power of the event. It's the sort of thing that sport can do rarely, but always utterly compellingly. That single tingling breathless moment seemed to unite a nation, and the thing that held it together was hope.